At a ceremony on April 19, the Clarke staff was recognized for its contributions to CMU’s Annual University Campaign (AUC). The AUC is a fundraising event in which CMU employees are asked to voluntarily give back to the University. Employees are allowed to direct their contribution to specific units on campus. As an added incentive the President’s office matches each dollar pledged with an additional fifty cents. This year the Clarke staff was recognized for having the highest percentage of donors for a CMU unit with less than twenty-five employees. 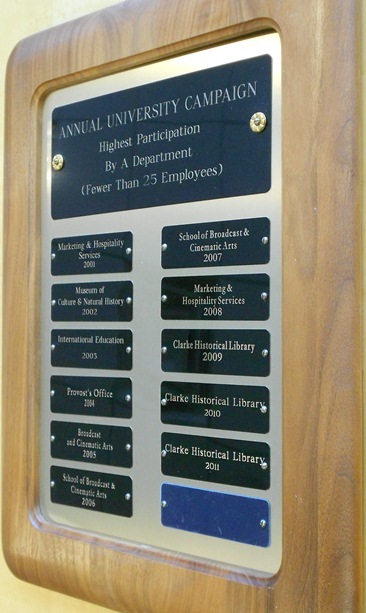 Although the award itself is significant, what is particularly noteworthy is that this is the third consecutive year the Clarke Library staff has been awarded this honor. Part of my job is asking people for things. 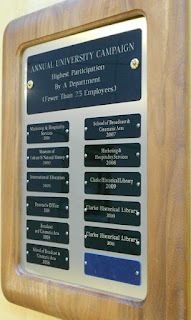 Whether it is a bunch of books in the attic or a sizable number of dollars, much of what the Library accomplishes is due to the public’s generosity. In a typical year at least one-third of our newly acquired material is donated. Annual giving and spendable funds from our endowment accounts make possible at least an additional one-third of our acquisitions, with this percentage likely to increase dramatically over time. 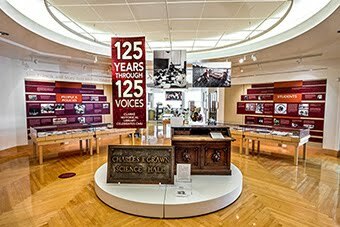 The spendable income from the endowments and annual giving also support a wide range of other Library activities and services, including speakers, exhibits, reference, and digitizing activities. Dependent as we are on our many friends for so much of what we do, it is nice to be able to share with them that those of us who work in the Library also understand the need for non-university funding and that we believe so much in what we do that what we support the Library’s activities with our gifts. Today, my thanks go first to the people I work with for their generosity, and then to you, for your generosity. Together, we make a difference.